Sue called from the breakfast table. 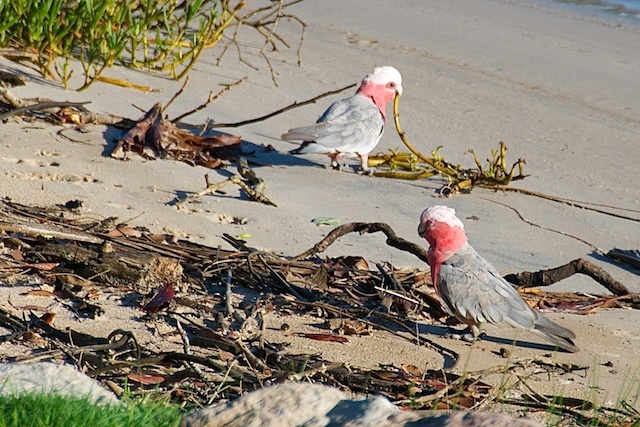 "There are galahs on the beach" she said. Not believing her for a second, I grabbed the camera and quietly slid open the door. There were indeed galahs on the beach, two of them, a long way from home. The strangest thing of all though, was the shadows that fell. We have had fewer sunless skies thus far this summer it seems, than a typical London winter, and if it weren't for the family and perhaps the temperature we'd almost be asking ourselves why we came back to this. But then if we hadn't, we'd have missed the galahs, and we'd be really, really cold and lonely about now, so there's not really any reason to ask the question!